Stormwater ponds are particularly important components of sediment control programs as they provide the last line of defence against the discharge of excess sediment to receiving waters. 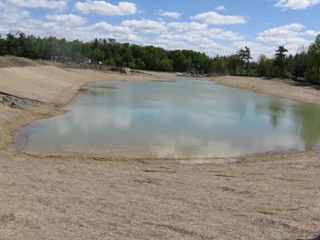 Interim Erosion and Sediment Control Guidelines produced by Toronto and Region Conservation Authority (TRCA) suggest using the post-construction stormwater management pond, designed to the Ontario Ministry of Environment’s ‘enhanced’ level guidelines, as a temporary sediment control pond. However, there is uncertainty about whether this practice provides adequate protection of receiving water, given that the levels of sediment and other contaminants in construction runoff are often significantly higher than the levels in runoff from a fully developed and landscaped site. The Greensborough and Ballymore studies were undertaken to address this uncertainty and determine the range of conditions under which stormwater ponds are an effective sediment control practice.